The best way to engage your students, even while taking NOTES!! 2. Download the Nearpod app on your moble device. Fill out the survey below to enter for a chance to win one of three free Gold Membership upgrades!! *A special thanks to the folks at Nearpod.com for donating the free upgrades. An interactive, engaging presentation tool that will blow the minds of your students! Great to use with Cloze notes. Allows students to interact with the new content by answering free response questions, drawing an answer, participating in a poll/survey and taking quizzes. Go to this page to see what Nearpod is all about and how it works. Sign up today! Check out How to Create a Nearpod Presentation #NPPs by Nearpod's Guides on Snapguide. Slide: As mentioned above, each "slide" is really either a PDF or image file. Thus, you need to build slides elsewhere if you want something more complex. Once you become familiar with exporting slides as image files however, this becomes a simple process. Slide Show: A series of images as a slideshow as opposed to one per slide in the presentation. Q&A (Free Response): Quick way to get real time checking for understanding. Quiz: Instead of a single question, have students answer a series of questions at their own pace. Video: Insert an MP4 (must be uploaded) to play back on devices or Youtube video. Draw it: Have students draw over a blank canvas or over an image. Choose which ones to share with the group. Browse the internet (upgraded feature): Share web pages with users. Audio: add an audio clip of you or a song. PDF Viewer: share a PDF file with your students. Live Twitter Stream: share a thread you want your students to follow. Matching pairs: have your students play the matching game, then answer a question. Fill in the Blank: write out sentences and the student have to fill in the blanks. TIP: Look for the settings icon to add even more customization to your interactive features. Example: You can add a reference image for question or have short answer responses instead of multiple choice questions. TIP: The Draw It feature has great potential across all curricula. Examples include: annotating over a passage, drawing/labeling a map, solving a math problem, balancing chemical equations, and more. 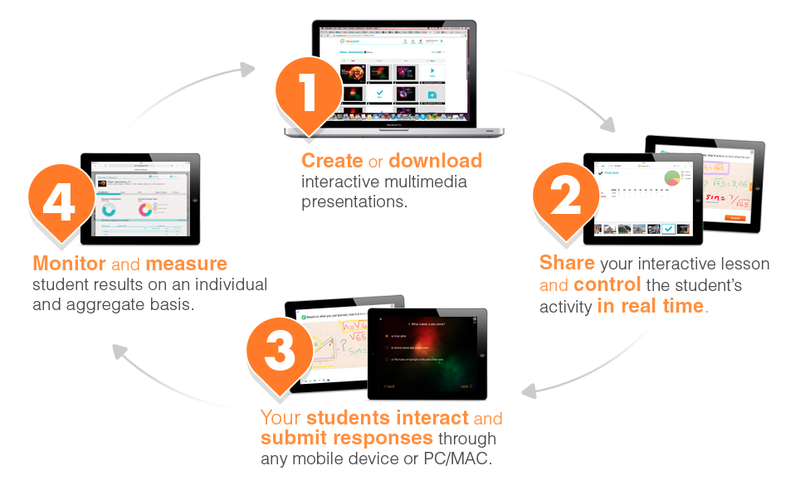 This is how you could send a Nearpod presentation as homework. You could embed it on your website for students to access at any time. When a Nearpod presentation is send as homework, it is student guided, not teacher guided.